I've been looking forward to today all week! 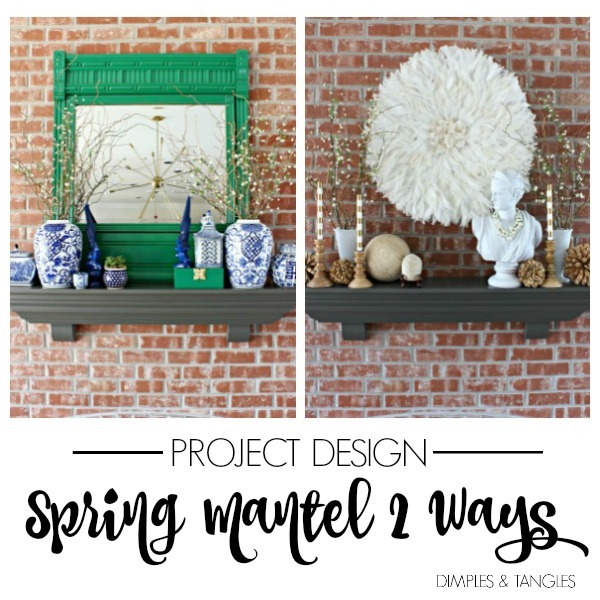 Cindy of Rough Luxe Lifestyle and Mary Ann of Classic Casual Home have graciously invited me and several other bloggers to participate in their Project Design: How to Style Your Spring Mantel Two Ways series. 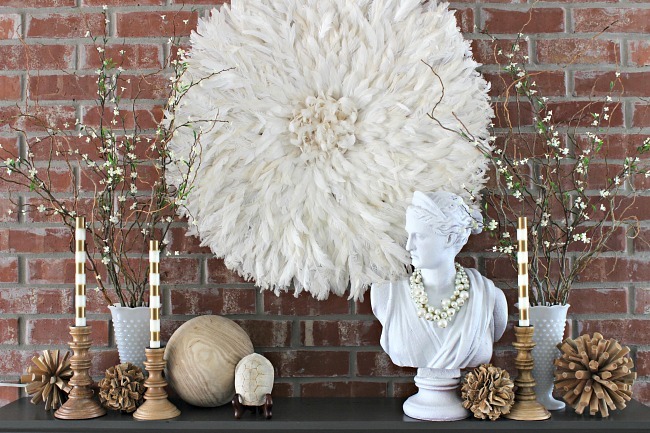 I'm all about new ideas for decorating the mantel, so I for one can't wait to read everyone's posts today. 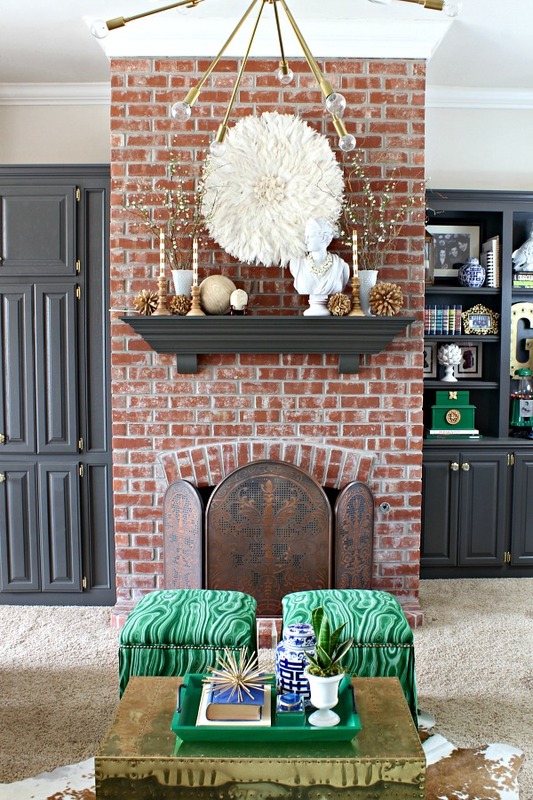 For my mantel designs, I went in two totally different directions for each one. If you're a regular reader, you'll know that the first is my usual style- bold and colorful. However, the second is new territory for me! 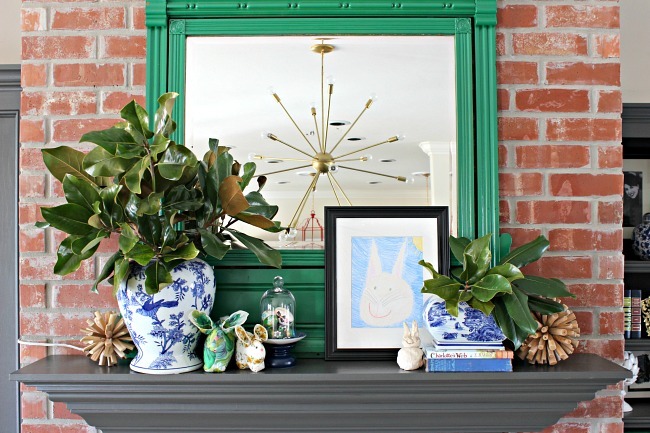 I meant to only have this antique green mirror out for my recent Christmas mantel, but it's fit right in not only at Christmas, but for my Valentine's Day mantel too, and now it's working hard for Spring! 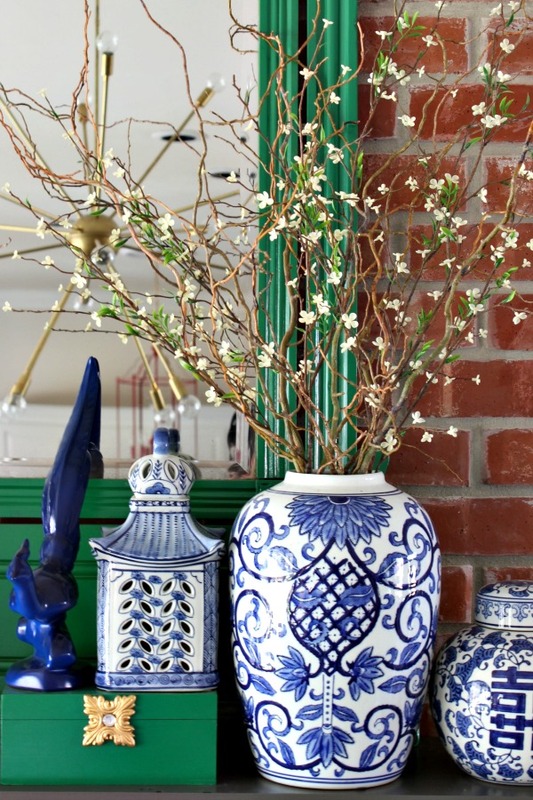 I gathered up several blue and white pieces and loaded them all together on the mantel. 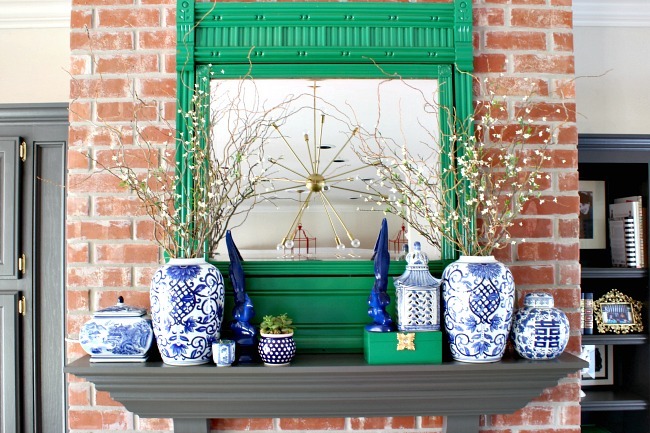 I just can't get enough of the blue/white/kelly green color combo. 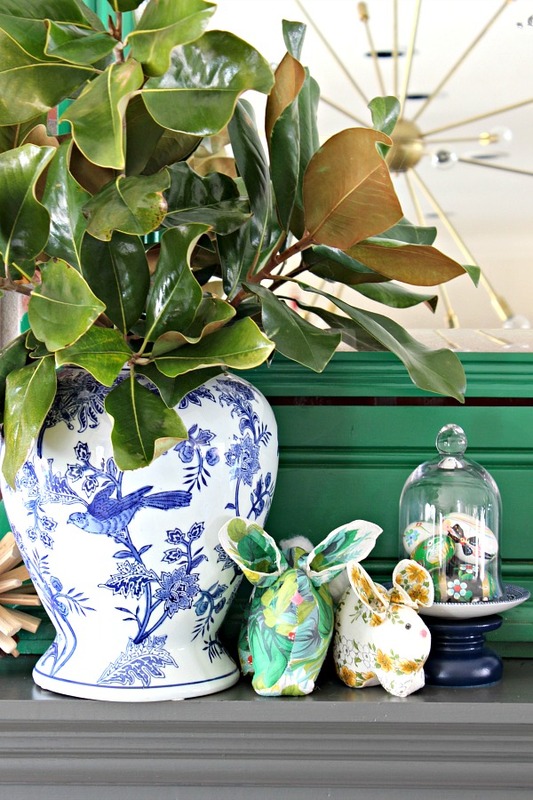 I shared this trick as one of My Five Favorite Ways to Decorate for Spring- our trees weren't quite budding yet, so I used faux blossom stems mixed in with some real curly willow branches from the yard. The real twigs mixed in help disguise the faux stems and make them more believable. Now, let's call this next mantel 1A. It's not officially one of my two, but I played around with the green mirror a little bit more and made it more playful and Easter specific. It's more knick-knacky than I generally like on the mantel, but all of those little things are special for our family. My Mother-in-law made those darling stuffed bunnies out of vintage handkerchiefs (cotton ball tails and all! ), and the hand painted eggs are a souvenir from our trip to Poland. And, my neighbor trimmed his magnolia tree at just the right time... yay for free greenery! On to my second mantel! I challenged myself to get out of my colorful comfort zone and use a neutral color palette. And you know what? I like it! Of course, how could you not like it when the Juju hat is the star of the show? 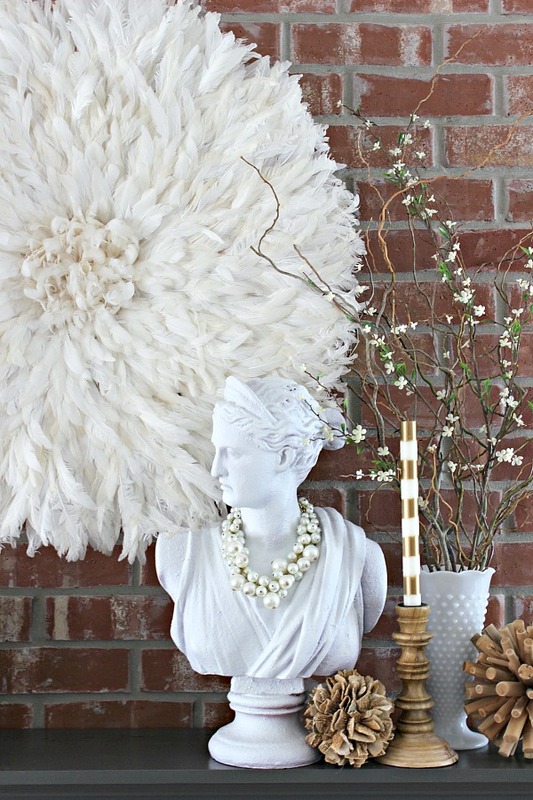 And, you didn't think I'd do a mantel styling post without including a bust, did you? 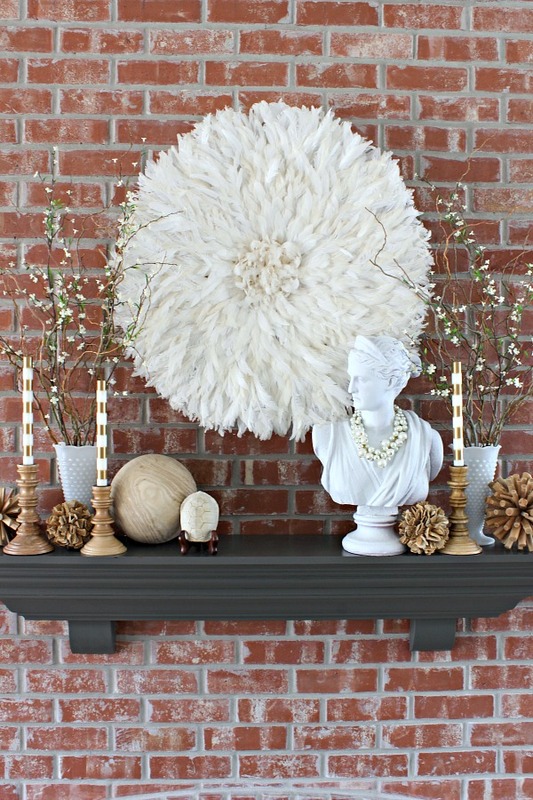 I actually think I'll recreate this mantel next winter, I would just need to swap out the Spring branches for something else. So what do you think? Do you have a favorite? 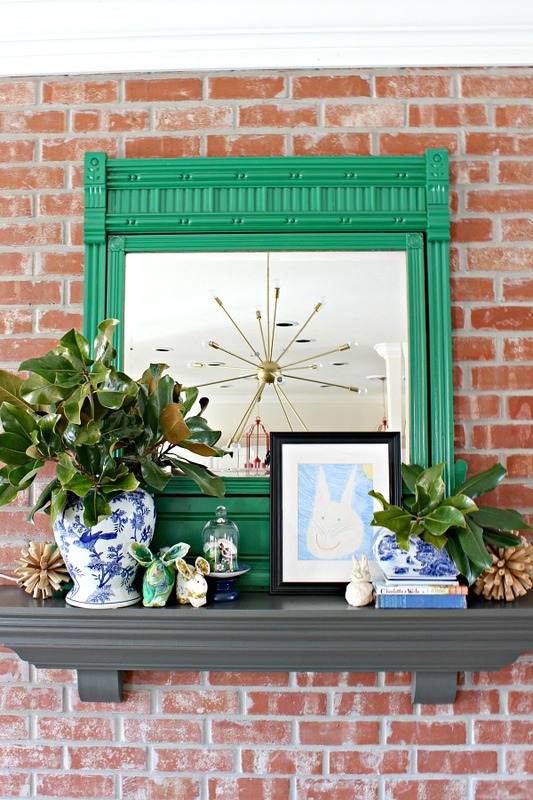 Be sure to head over to the other participants' blogs today to see 18 more inspiring Spring Mantel ideas, too! You can also follow along with all of the participants on Instagram under the hashtag #ProjectDesignNow (and find me on Instagram here if you're not already following along!). *Affiliate links used. I receive a small commission at no extra cost to you. Thanks for supporting Dimples and Tangles so that we're able to keep great content coming regularly! You are the styling master!! I don't think I can decide which one I like the best, they are all so great in different ways. 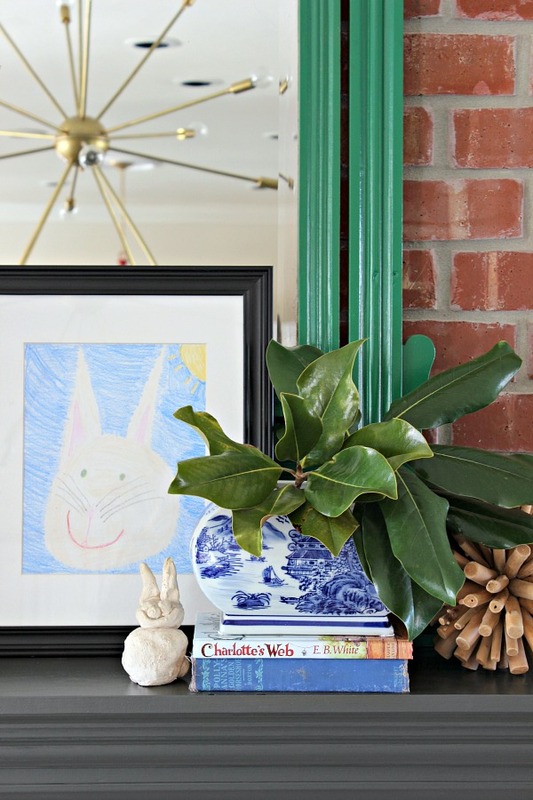 Love the kelly green with the blue & white, that packs such a punch, but then the sentimentality of the Easter mantle gets me (awww that bunny you made in 2nd grade that your mom kept all those years?!!) and then I adore the juju hat neutral awesomeness. 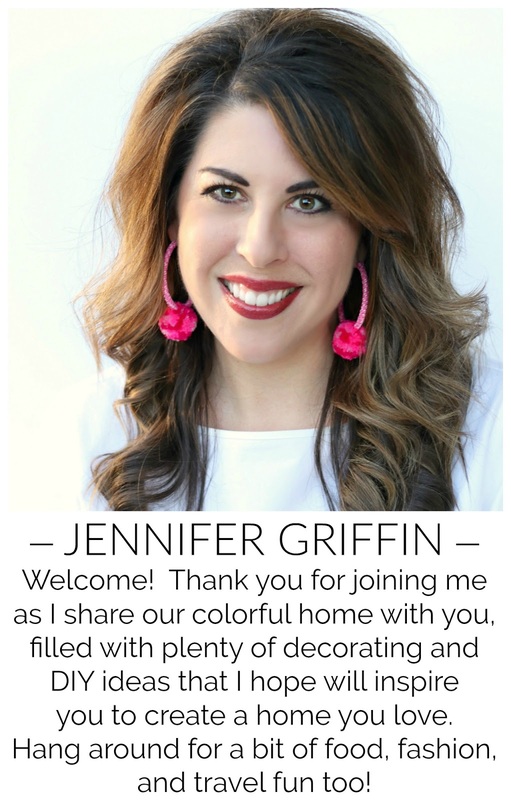 PLEASE come style my whole house!!!!! ok so i love the blue and was like oh nothing can top this! and then i saw the neutral and was like oh i love this so much, too! and i love them both so differently, like i love my kids. ;) i don't love one more than the other but both just so much! These are all spectacular but I have to say I love the first incarnation the best. I love your signature bold and beautiful style. They are all extremely clever and I love that you travelled outside your wheelhouse for the neutral one! Thank you so much for participating! I knew yours would be fabulous!! They are both amazing. The blue and green is so beautiful and the white is absolutely stunning. I love both. 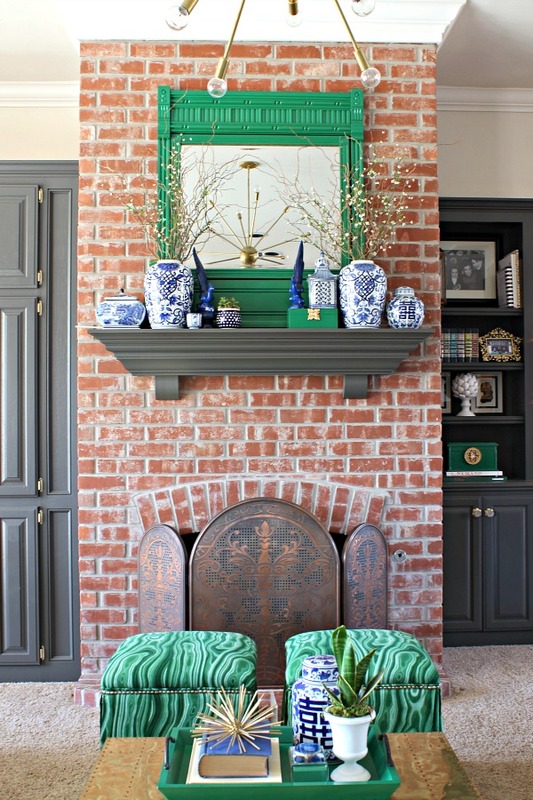 I always love your colorful mantle decor, and the personal touches to the Easter mantle are perfect. And, I will have to say that you killed it on the neutral mantle! It is beautiful! But, I think the first one is the best for spring - bright and cheerful and fresh! Off to get some more mantle inspiration! Stunning !!! All three are awesome. Which are you leaving up? So fun to rotate. Love your style, Jennifer. I love all 3 versions. The bunny drawing is especially endearing. 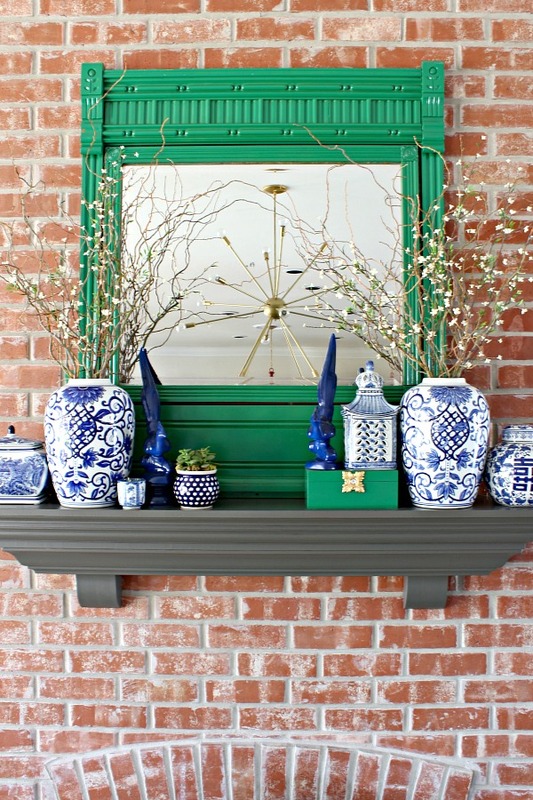 Blue and white paired with the kelly green is really pretty. It was fun to find new (to me) bloggers to follow. They look gorgeous!!! Both are beautiful and are totally different. 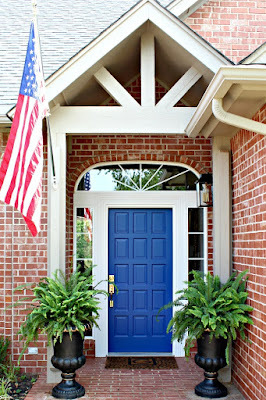 I'm drawn to the blue and white pieces immediately, however. What a masterpiece you have created here in both designs. I had to look twice to see that they were the same space, same mantle. Love them both! They both are so beautiful and so different. I too had to look twice at the surroundings just to make sure it was the same space. Awesome job! First, I love your mantelscapes! Second, (I know you've probably been asked and answered this before) WHERE did you find that absolutely awesome, stunning, beautiful fireplace screen? I've never seen anything like it and I'm positively drooling here! Hi Kathy! I hate to say it... Craigslist. ;) I've never seen one like it either! Well I love the first one because it reminds me of you and your style but you probably gather I'm a neutral girl so if you just want to box all of it up and send it my way that be great! Lol!!! Both are beautiful! But, I'm totally partial to the first one. 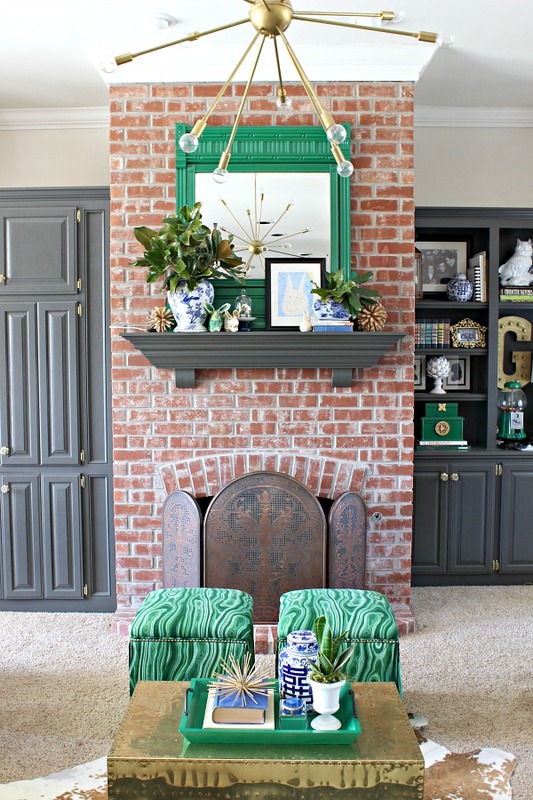 Kelly green and navy...my weakness!